Until 1927, the photographs that Ansel Adams had taken were not very good: documentary records of an afternoon with friends, a tree that he admired, a sunset worth remembering. They were placeholders for meaning, but not particularly meaningful themselves. When I am ready to make a photograph. It is April. 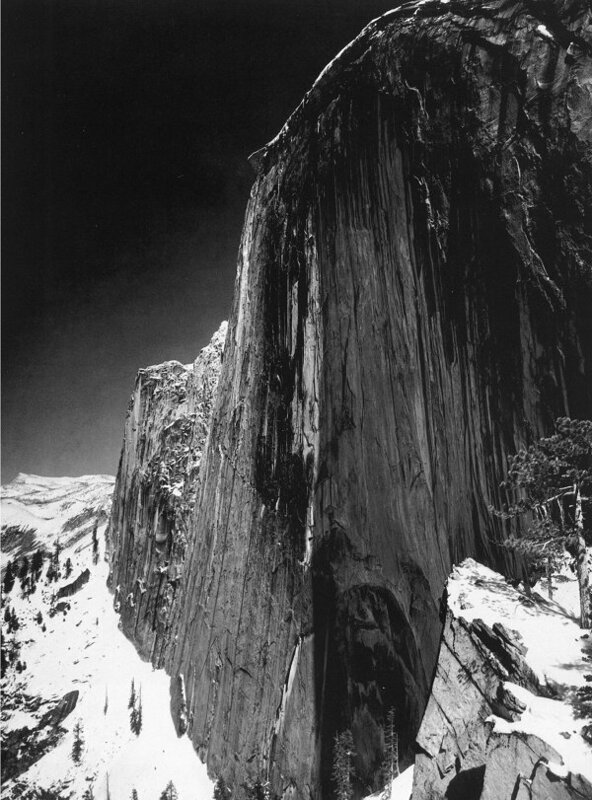 And once again Adams is in Yosemite National Park, halfway up the granite face of a structure called Half Dome. He’s on his way to a popular spot among hikers called the Diving Board, a long and narrow projection of rock from which you can look up and see the sharp sheer face of the Half Dome’s cliff rising up before you. Along the way, Adams stops to take some shots—his girlfriend, his buddies, a bird, his shoes—until he realizes upon reaching the Diving Board that he has only two pictures left. He positions the camera to face Half Dome, that great and monstrous cliff face that looks as if it has punctured the earth from the inside out. Wow, Adams thinks, then clicks. Immediately, however, he knows that the picture he has taken is not going to work, will not relay to viewers the true experience of the Half Dome. So with only one picture left, Adams takes a risk. He allows himself to “revisualize” the scene. (His word.) He places over his lens a heavy red filter that immediately darkens the sky, transforms it even darker than the cliff face itself, so that an abyss opens up on the left side of the cliff, as if the brooding shelf of Half Dome has torn straight through it like a cleaver made of light, terrifying and bright, a threat to everything that is not there. John D'Agata is the author of On Knowing & Not, a collaboration with Belgian painter Jean-Baptiste Bernadet. He teaches creative writing at the University of Iowa, where he directs the Nonfiction Writing Program. Thank you for this. I've always loved the photographs and in March, I saw "Moonrise, Hernandez, New Mexico" in an exhibition of American landscape art at the Hunter Museum in Chattanooga. It wasn't the photograph I'd remembered, somehow -- the light more intense, the contrasts almost beyond crisp. Very compelling and beautiful, of course. So it was intriguing to read a comment by the curator -- I don't have my own notes about the exhibition at hand so will have to try to recall as precisely as I can -- indicating that Adams printed his images from the negatives as a musician might play a musical score and that no two prints were the same because his own interpretations were never quite the same. That there might be shifts in emphasis from one print to another just as we never hear a musician approach, say, a Bach partita in the same way twice. It seems to make a photograph "feel" like a mountain you would need to do something like what Adams did -- photographs are limited in what they can show and feel -- Adams was expanding the scope of the art form to make it more natural.